When planning your next trade show, you’ll have to decide between using the advanced warehouse and shipping your items direct to show. As you know, there’s a lot of work that goes into planning an exhibit at a trade show. You have to analyze and plan your sales and marketing goals, come up with a booth design and layout, and train your representatives… all while staying within your budget! Then, when the exhibitor packet arrives, you have to go through and parse all of the rules and regulations surrounding the show! And we haven’t even mentioned one of the most important parts of the trade show experience – how to get everything to its final destination! There are two methods commonly used for shipping in the expo world. The first is shipping to an advanced warehouse, where the booth and all supplementary items are sent to the show’s warehouse 6-8 weeks before the show date. The second method is direct to show, where these items are sent (as the name implies) directly to the show site a few days before the show date. Which of these two methods is better? There isn’t a clear-cut answer – your unique needs will determine whether advanced warehouse or direct to show is a better fit for you. Each method has pros and cons that should be weighed carefully during the trade show planning stages well in advance of the show date. 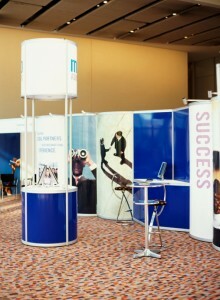 By considering your options carefully, you can make your trade show exhibiting experience smoother and less stressful! When you decide to ship your booth and other items to an advanced warehouse, you can alleviate some of the burdens that come with getting your show materials or booth and promotional items to the show site in time. Your cargo is shipped and stored in the warehouse 6-8 weeks before the show date, then a contractor delivers your items from the warehouse to the site, making your company one of the first to move in. This helps avoid the risk of your items arriving late – you have plenty of time to handle and address any shipping issues that might arise. You’ll also avoid overtime handling, and you won’t be charged any storage fees on the days your booth and items are in the warehouse – everything is covered. There are, however, a few cons to the advanced warehouse method. You may be charged more for material handling. Usually, there’s a hard deadline for when your freight has to arrive at the warehouse, so if it comes in late, you may be subject to additional charges. Also, warehouses only accept pallets, crates, trunks, cases, and carpets, so any pad-wrapped and un-skidded items are required to be shipped direct to show. Finally, the biggest disadvantage to using the advanced warehouse is that your exhibit must be prepared well in advance of the show date, giving you very little latitude to make any last-minute changes. The first advantage of going direct to show is clear – by waiting until just a few days before the show date to ship your booth and items, you maximize your preparation time and give yourself plenty of time to adapt your display. In addition, there’s less handling – your items go directly to the floor instead of the extra step of unloading and loading at the warehouse. This helps mitigate the risk of damage to your items and can save you handling fees. And your cargo is more secure when they go directly to the exhibitor relative to going to a warehouse first. However, the risks associated with shipping direct to show are also clear. By waiting until a few days before show date to ship, you subject your items to the risk of shipping delays. In addition, there is a set first move-in day, so if your items arrive early, you will be charged additional fees. Also, there may be waiting times at the marshalling yard for your items, and your provider could end up charging you for this waiting time – and waiting at the marshalling yard costs your team crucial time needed for setting up your booth at the show. In short, direct to show requires very precise timing to work, but it can be extremely rewarding when it does. This entry was posted on Thursday, March 29th, 2018	at 11:05 am	and is filed under AFP Expo	. You can follow any responses to this entry through the RSS 2.0	feed. Both comments and pings are currently closed.